I’ve heard it said that expectations are premeditated resentments. Although the statement rang true, a recent experience took the meaning to a whole new level. A situation I was in fell far short of my expectations. Going into it, I wasn’t consciously aware of the expectations I held. That’s how sneaky they can be! Not only did I come away upset, there was also resentment towards the person that I felt was responsible for my disappointment. I’m ashamed to say that it took me several days of nursing my wounded feelings before I fully realized my part in this. It’s impossible for another person to know my expectations. How can they when I am not fully aware of them? Even if I am able to vocalize what I expect, I’m sure there is more that I just assume. Variables and the unexpected come into play, throwing off even the best laid plans. The only thing I can be certain of is my inability to control the final outcome. My life works much better when I put my complete faith and trust in Jesus. I have found that the fewer expectations I have, the more he is able to work. In essence I believe this is because I stop resisting the changes to my plans. The only expectation that works for me is to know Jesus is able to handle anything that comes my way and to use it for his greater purpose. My husband and I recently attended an event called Behind the Masque. It was mandatory for everyone attending to wear a mask. I had discovered that it wasn’t easy to fit a mask over my glasses so chose to have one painted on. After I told the face painter that I liked turquoise and had a book coming out with the word Dragonflies in the title she came up with the amazing design you see pictured here. It was a work of art and seemed such a shame to have the canvas washed clean later that night. Although people wore masks during the evening, we could usually tell who was behind them. This made me think of the masks I have hidden behind in my life. Maybe I haven’t hidden quite as well as I thought! My struggle has been to be authentic. My ego doesn’t want to let people know that everything in my life isn’t perfect. They may not like me if they really know what’s behind this mask of confidence and self-assurance. I was speaking to a friend about this and we agreed that wearing these masks is exhausting. She had recently taken hers off and was amazed at the new depth in her relationships. In order to remove my mask I had to stop thinking I needed to do things on my own strength. Instead, I allow Jesus to take control. He has told us that he works best in our weakness. No I don’t see my weakness as a bad thing, but as an opportunity to let his strength work through me. In the early morning hours, we drove to an airport shuttle service. We entered the lot and followed another vehicle to the appointed row. After parking and unloading our luggage we walked stand by the couple from the other car. The shuttle bus slowly worked its way down our row, picking up groups of people along the way. The woman became more agitated, constantly muttering about missing the flight. A few more such comments were made as she took her seat on the bus. Just before we exited the lot, she realized that her purse wasn’t with her. Calling out to the driver, she said she had left her purse in the car and we needed to go back. The driver obliged but of course this delayed all of us in getting to the airport. We were flying on different airlines so don’t know if she ended up missing her flight. What I do know is that she reminded me of a very important lesson. It serves no purpose to worry about things I have no control over. What I need to do is to take care of the small details that are within my control. In this way I will cause less stress not only in my own life but also in those around me. When I do my part and then leave the rest up to God, life runs much smoother. A wise man once told me, “It’s no use laying awake at night worrying about your problems. God’s up anyway so give them to him.” This advice has served me well. It is amazing how much better I feel when I pray and leave the things out of my control in the hands of my heavenly father. 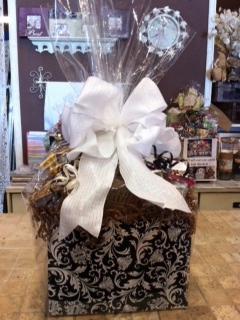 The owner of the store I work in is known for the amazing gift baskets she creates. When she wanted to teach me how to do them, I panicked. Feeling that I don’t have a flair for that sort of thing had me terrified to even attempt it. As she guided me through the creative process, I secretly hoped the day would never come when I would have to make one on my own. Through her encouragement and belief in me, I slowly gained confidence. Then the fateful day came when it was necessary for me to create a basket completely on my own. The fact that I enjoyed picking out and arranging the items in the basket surprised me. After wrapping it and making a bow, I stood back and admired what I had created. I even took a picture of the finished product! The saying “I didn’t know what I could do until I did it” came to mind. Thinking about this, I realize how many times I have been stopped in my tracks by something I thought I couldn’t do. Now I realize that just because it’s something I’ve never done before, doesn’t mean I can’t do it! When I stop and pray about the situation, Jesus guides me every step of the way. Through Him, I am able to accomplish far more than I ever thought possible. When those negative, “I can’t do it” thoughts enter my mind, I just need to think of the gift baskets and remember that all things are possible through Christ Jesus.